What’s on Your Plate? is designed to be a conversation amongst good eaters. Tell us about a recent meal. Did it meet with rave reviews? Or did it bomb? What side dishes did you pair with the star of the show? Did you try a new ingredient? Find the groceries at great prices? Share what’s on your plate! Each week a featured foodie* will share his or her plate and then the rest of us will get a chance to link up our own posts or share in the comments what good cheap eats we’ve been enjoying. If you joined Jessica on her recent Pantry Challenge, you probably learned a lot about your freezer and pantry stash – what you keep on hand, what you keep too much of, and what got lost in the freezer sometime last April. One of my favorite meals to build out of pantry and freezer staples is soup, and since I’ve been gearing up to explore all things soup on The Cheapskate Cook, this particular recipe was a fabulous find. Egyptian Lentil Soup is mostly made of basic “real” foods that are easy to keep around for awhile and inexpensive to buy. I adapted the recipe to use butter or olive oil, added some cumin per the suggestion of another cook, and threw in a few handfuls of chopped spinach for some extra nutrition. 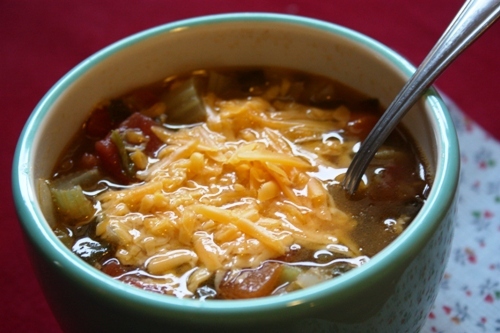 Garnishing it with shredded cheddar really took this delightfully simple and flavorful soup over the top. In a large saucepan melt butter. Add vegetables, garlic and bay leaf, sauté until vegetables are tender. Add lentils, chicken stock, tomato, pepper, and cumin to vegetable mixture. Pour enough water into saucepan to cover. Simmer until lentils are tender, approximately 30 minutes. Add spinach (or kale) and salt, and cook on low for 5-10 minutes, until spinach has wilted. Optional: Pour hot soup into a blender and puree. Serve immediately and garnish with cheddar cheese. — When Steph and her husband got married, they lived in a renovated shed and had a grocery budget that matched. As a passionate whole-foodie, Steph was determined to continue eating healthy, minimally-processed foods on their shoestring budget. So The Cheapskate Cook was born. Share with us a recent meal you prepared. Either link it up below or tell us about it in the comments. Please make sure that you link to www.goodcheapeats.com in your post so others know where the dinner party is. I just made a soup almost JUST like this on Monday night. The only difference was that mine had a sweet potato and some quinoa in it. It was super thick too! Yum! I still have a ton and have been eating it for lunches, thanks! This week I shared my Cinnamon Noodle Kugel. You can add raisins, but I don’t like them. Any type of noodle is fine. On my plate today is mushroom quiche (using Julia Child’s basic recipe for the quiche) and shredded carrot salad with a savory a lemon vinaigrette (from the cookbook, La Cuisine). Your soup looks yummy! Lentils are so good for us. I wish I used them more in my cooking. I added my Red Velvet Heart-Shaped Whoopie Pies to your linky. It’s the first time I made them. They’re so good! Thanks for hosting! That soup looks amazing. I love lentils but rarely cook with them. Sounds good on a cold day like today! I linked to my Korean Chicken recipe. It goes great with the Roasted Cauliflower that was posted earlier on my blog. Your Egyptian lentil soup looks truly comforting. I’ve added my beetroot and cumin pasta to your linky. Its the first time I made the dish and loved it, so thought your Whats on your plate was a good opportunity to share. I also like the idea and am so glad that I have stumbled upon your blog. What a great selection of dishes! Glad I found the group. Whoops made an error when typing in the name of the recipe (see 18). Unsure how to correct it, So had to go back and do linky again (see 24) – sorry, but I hope you like the recipe. Tonight was lasagna, garlic toast (Texas Toast), Caesar salad. Thanks for hosting this party. great site. that soup looks so yummy! I just made the soup and it was fantastic! The only change I made was using a can of stewed tomatoes in place of a tomato. The longer you cook it the more the lentils soak up the water. Mine turned out more like cooked lentils than soup. You can add more water or broth to make it soupier. Last night was homemade pizza- I made the crust in my bread machine and the sauce was homemade. I think my husband was skeptical about the homemade sauce but it was good! I have finally mastered spaghetti and pizza sauce. My other homemade goals for the year include chili from scratch (no canned beans or jarred seasonings but canned tomato sauce is ok), baked beans from scratch (again no canned beans), and salad dressings. I’m tired of shelling out money for chemicals! I am going to try this recipe this weekend since I have everything in my pantry!!! A little hint from my mother-in-law about using peeled tomatoes in recipes. You can grate the tomato in a standard box grater and when you are done all you have left is the peel. I don’t know if grated tomato will be good in this recipe, but I love the simplicity of it so I’m going to try it. Using grated tomatoes is also the way my mother-in-law makes her fresh tomato sauce. Heat some olive oil, add minced garlic to infuse the oil, add grated tomatoes and fresh or dried herbs (fresh basil is wonderful), then top with some good-quality Parmesan or Romano and instantly you have a very nice and simple pasta dinner that only takes minutes to prepare. I just made this soup. It is AMAZING! So flavorful, I’m a big meat eater and I did not miss meat at all! I’m making it again to take to church for our soup lunch this Sunday! I added stewed tomatoes instead of diced tomato, and added a jar of home canned tomato juice to it. YUM! Sorry, I put my name instead of the name of my meal. 🙂 I am happy to get this recipe for the lentils. I love them but have limited uses for them. Thanks! Where do you find lentils in the store? I am not really sure if I’ve ever had them or know much about them, but I don’t even know where to look. Also, this quinoa stuff, what section would that be in? Thanks a lot! My walmart was out of lentils in the bean section, but I found a bag in the Mexican food section.